Guaranteed to keep the kids engaged for Passover. 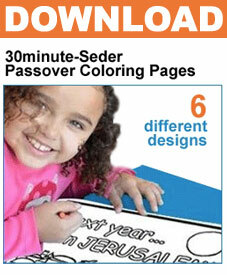 You get the full set of 6 wonderful made-for-Passover coloring page designs. Best of all...you get to print as many copies as you like for your Seder guests. Laminate them and they can be brought out at Seders for years to come! Of course crayons are not included. If we ever come up with a way to download those we'll let you know! Seder Table - Exodus - "Next Year in Jerusalem" - The 10 Plagues - The Four Children - Find Hidden Passover Objects"